The Internet is a great source of reference for Masonry. While doing some research for another article, I ran across some nice examples of Masonic artwork and thought I would share them with you here. 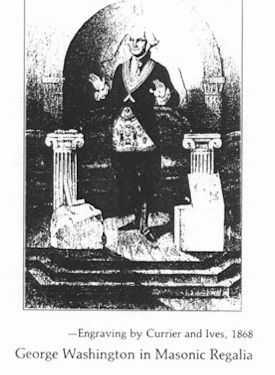 This print is a nice sketch of George Washington's Masonic apron. 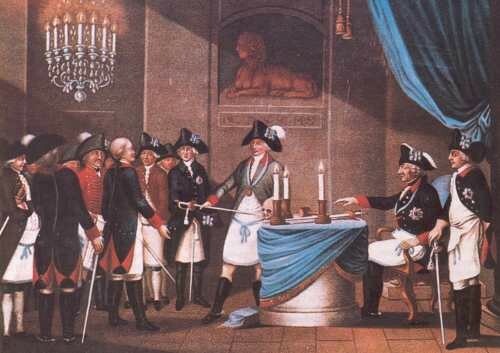 It is depicted on many Masonic sources and shows great detail. You can see that is was a beautiful piece of Masonic artwork benefitting our nations first president. The piece to the right is a depiction of Masonic symolism and was probably created in the late 18th century. It is a color print and it does show a nice amount of detail. This piece of artwork depicts George Washington as "America's architect" This was a Currier and Ives print from 1868 and was very popular in it's time. You can note the George Washington in this print seems to be wearing his famous apron which I showed above. The era encompassing the start of our country was also a very popular time for Masonry which accounts for the many stories about the start of this country being intertwined to Masonry. This final color print shows a gathering of brothers at Lodge while it seems the Lodge is opened. Note the brothers all are wearing their aprons and it looks like a newly made brother is in attendance. There are literally hundreds of found artwork regarding Masonry and some were so detailed that I felt these should not be shared as some are extremely detailedregarding the craft. However, as I find some examples, I will periodically post them on the blog. And as always if you have any Masonic artwork you wish to share just send them to my E-mail and I will be glad to accomodate you. One thing I would like to post on a local level is if any brothers from Long Island Lodge, especially in Suffolk have any old prints or pics and would like to share them you can let me know and I will try to get them on here. I believe it would be an interesting collection of local Masonic History.